Road safety charity the IAM is offering weekly motoring tips from Britain’s top advanced driver, Peter Rodger. This week he is advising motorists on how to drive safely through fog. 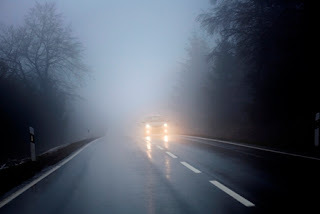 “Fog is one of the most difficult conditions to drive in. Ensure you are prepared so that you can carry out your journey safely, and allow lots of extra time for the trip.” commented Peter. Before setting off, clean your windows and windscreen and ensure all your lights are working. When you’re ready to leave, switch on the dipped headlights. Use front and rear fog lights if visibility is less than 100 metres, but don’t forget to switch them off when visibility improves – leaving fog lights on when headlights would be adequate is an offence. Use your windscreen wipers on an intermittent setting to clear moisture. Switch the heater or air conditioning on and leave it running to keep the inside of the glass clear. Slow down and keep enough distance between yourself and the vehicle in front - make sure you can stop safely within the distance you can see clearly. Fog is not the same density all the time – it may get thicker, slow down if it does. Be aware that other vehicles may be travelling without their lights on, so extra care and attention is needed. At junctions, wind the window down and listen for traffic. Take high-viz clothing in case you have to leave the car. “Don’t underestimate the effect fog has on your visibility. Adjusting your driving to the weather conditions will help you to become a safer and more confident driver through the winter months.” continued Peter. To help drivers stay safe this winter, the IAM has launched a winter driving campaign which includes a dedicated website, drivingadvice.org.uk, with traffic updates, weather forecasts and tips on how to drive safely in winter. Tips cover rain, snow, ice, fog and wind – everything you can expect in a typically unpredictable British winter. Check it out before you travel. The IAM is the UK’s largest independent road safety charity, dedicated to improving standards and safety in driving, motorcycling and cycling. The commercial division of the IAM operates through its occupational driver training company IAM Drive & Survive. The IAM has more than 200 local volunteer groups and over 100,000 members in the UK and Ireland. It is best known for the advanced driving test and the advanced driving, motorcycling and cycling courses. Its policy and research division offers advice and expertise on road safety.